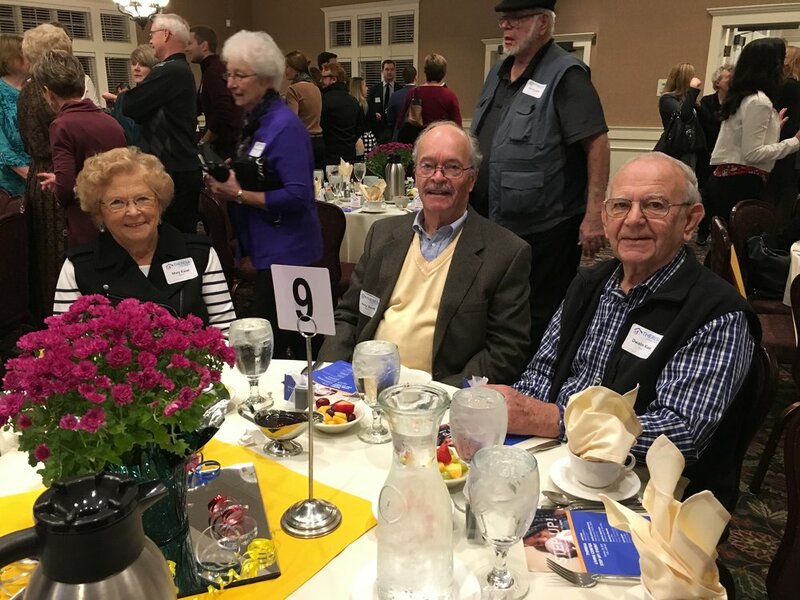 Theresa Living Center celebrated its 30th anniversary at the fourth annual fundraising breakfast on October 30th at the Midland Hills Country Club. We raised more than $60,000, which enabled us to access two matching grants from the Katherine B. Andersen Fund of The Saint Paul Foundation ($25,000) and members of the Theresa Living Center Board of Directors ($30,000), giving us a total of over $100,000 raised! Thank you so much to all who attended and supported the event. We also marked our 30th anniversary with a special presentation to the School Sisters of Notre Dame and the Church of St. Casimir, who have supported us so generously over the decades and continue to do so today. See more about the event in the photo captions. We’d like to especially thank the Katherine B. Andersen Fund of The Saint Paul Foundation for underwriting the cost of the event, and to all the volunteers and staff who helped make the event such a success. More than 200 attended our 30th anniversary fundraising breakfast. Thanks to generous donations, we raised more than $60,000, helping us to earn more than $55,000 in matching grants from the Katherine B. Andersen Fund of The Saint Paul Foundation and the Theresa Living Center Board of Directors. Thank you to everyone for your wonderful support for our mission! Pictured: Mary Kasel, Jerry Sanft, and Dewain Kasel. Keynote speaker Acooa Ellis, Senior Vice president of Community Impact for the Greater Twin Cities United Way, spoke about the challenges of addressing homelessness in the Twin Cities. Board Chair Dennis WIlliams gives a plaque to Sisters Marilyn Orchard and Rita Jirik of the School Sisters of Notre Dame. 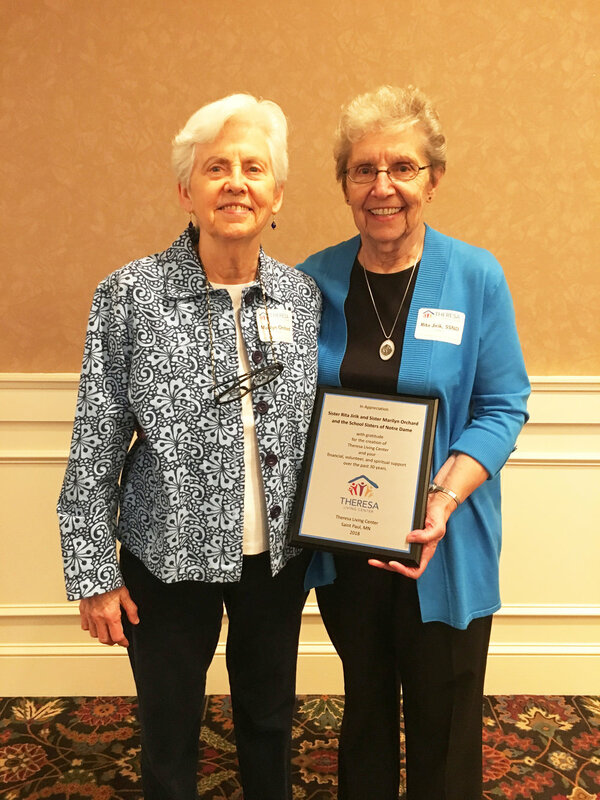 Sisters Marilyn and Rita founded Theresa Living Center, which opened its doors to help homeless women and children in 1988 as a project to honor Mother Theresa Gerhardinger, an educator of girls and the foundress of their order. 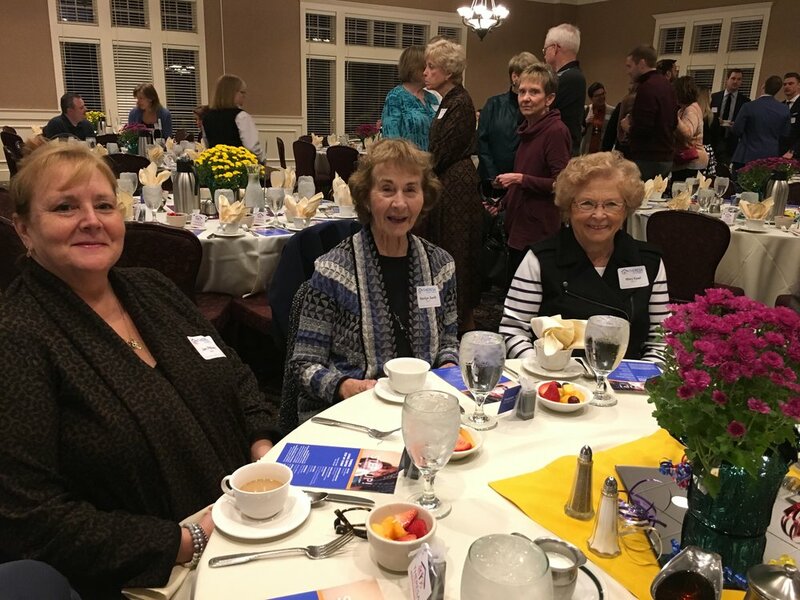 Thrilled to have so many School Sisters of Notre Dame at the breakfast, including many stalwart volunteers and supporters, not to mention our two founders! Left to right: Sisters Paulette Pass, Suzanne Eichler, Mary Gen Olin, Marilyn Orchard (founder), Rita Jirik, (founder), and Paulissa Jirik. We are so grateful for all of the love, hard work, and generous financial assistance the SSND has given us over the past 30 years! Sisters Marilyn Orchard and Rita Jirk, SSND, our two founders. 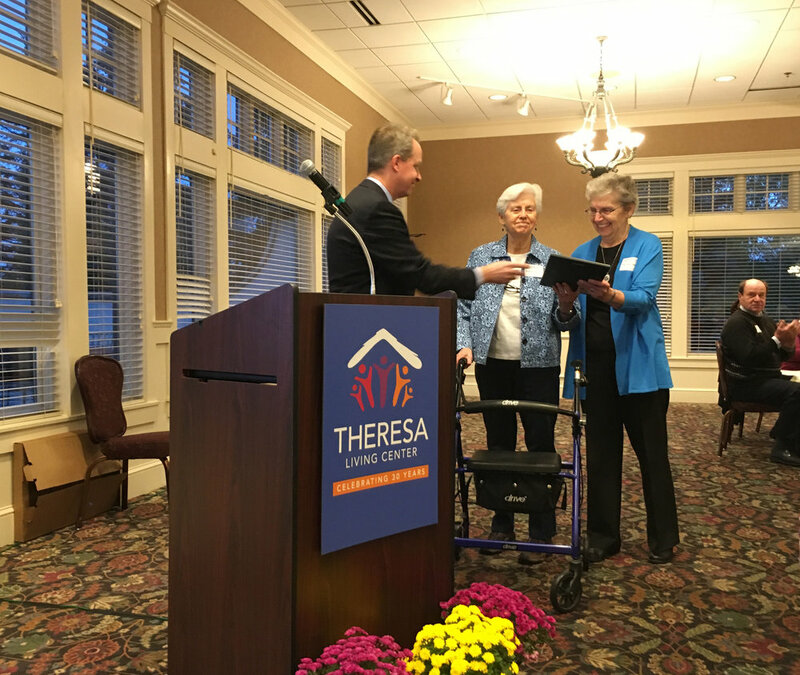 They were presented with a plaque acknowledging the SSND's role in the creation of Theresa Living Center in 1988 and their generous ongoing support in time, financial assistance, and talents. Sherellia Moore, keynote speaker Acooa Ellis, and Theresa Living Center board member Karla Benson Rutten. Wonderful music by keyboardist Thomas West and vocalist Maurice Jacox, who performed several selections during the event. They added so much to our morning—thank you, gentlemen! Celebrating our 30th anniversary this year—thanks to all the volunteers and board members who made the event such a smashing success! The event was held at the Midland Hills Golf Club. Thanks to Mary Jo Mahowald for being our Midland Hills sponsor. Jan Pithey, Marilyn Sanft, and Mary Kasel. 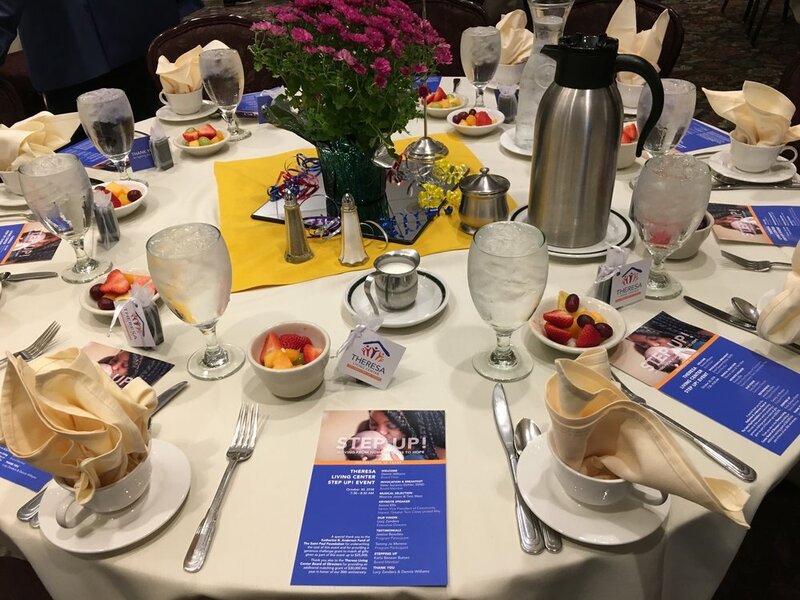 We're excited to announce that the date for our 4th annual fundraising breakfast will be on Tuesday, October 30, at the Midland Hills Country Club in Roseville, MN! This year marks our 30th anniversary, so there are going to be some extra fun this year. Save the date on your calendar and watch this space for further information! If you would like to join us, please call us on 651.774.5594 by October 25 to be placed on our guest list! 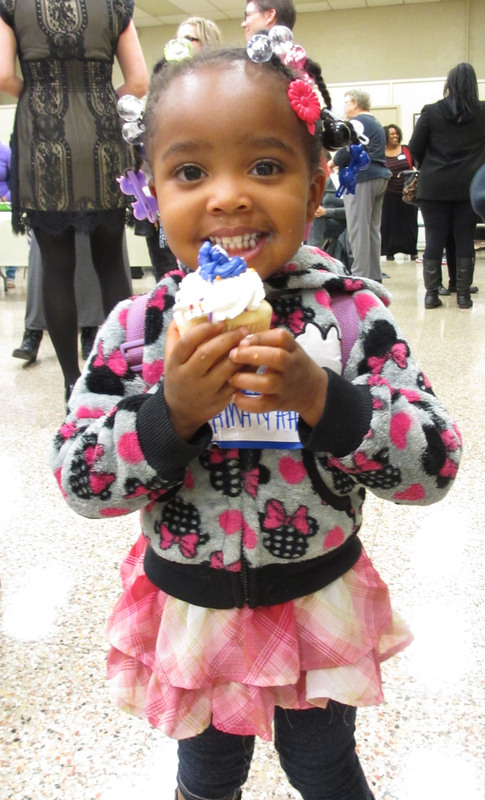 Thanks to everyone who came out to our friends & family picnic on August 9! More that 160 people attended—and we had perfect weather, too! Thanks to all our volunteers and staff who helped make it such a success, and to Mark Nelson for photographing it for us! Also thanks to musician Devlan Sheahan, and face-painters Rachel Pastick and Nick Malm. So great to see you all there! Thank you to all of our STEP UP! Donors for Helping Us Raise $65,000! We have so many blessings to count this year. Thanks to the generosity of donors at our October breakfast, we raised more than $65,000—nearly doubling what we raised the previous year. Italso meant we were able to receive a wonderful challenge grant of $25,000 given by the Katherine B. Andersen Fund of The Saint Paul Foundation. We also received a generous gift of $10,000 from the Joan and Bruce Richard Family Foundation. When we think back just two years ago—when we were thinking about having to close our doors—it’s truly a humbling moment! Mark your calendars for our third annual fundraising breakfast! 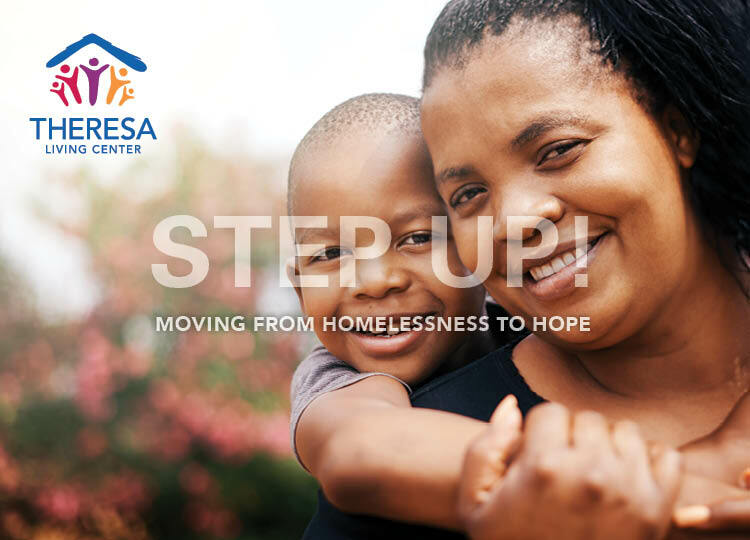 We’d love to have you join us to learn more about how we help women and single-parent families move from homelessness to hope and self-sufficiency. It’s a great way to start your day and includes music, fellowship, and inspiration. Our guest speaker will be Dr. Shonda Craft, Interim Dean, School of Health and Human Services at St. Cloud State University. One of our clients will also speak about how TLC helped her establish a new path to stability and success. And thanks to the generosity of the Katherine B. Andersen Fund of The Saint Paul Foundation, all gifts given as part of the fundraiser will be matched—up to a total of $25,000! If you would like to join us for the fundraising breakfast, you will need to be on our guest list. Please call us on 651-774-5594 to RSVP. Thank you—we’ll see you there! Our second annual Step Up! 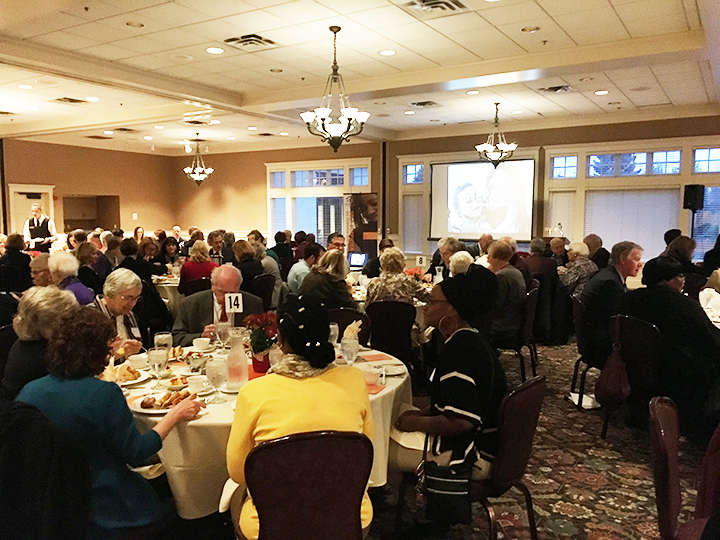 Fundraiser on October 26, 2016, was a smashing success—we raised more than $20,000 over our goal and received a matching challenge grant of $25,000, generously given by the Katherine B. Andersen Fund of The Saint Paul Foundation, which also underwrote the cost of the event. 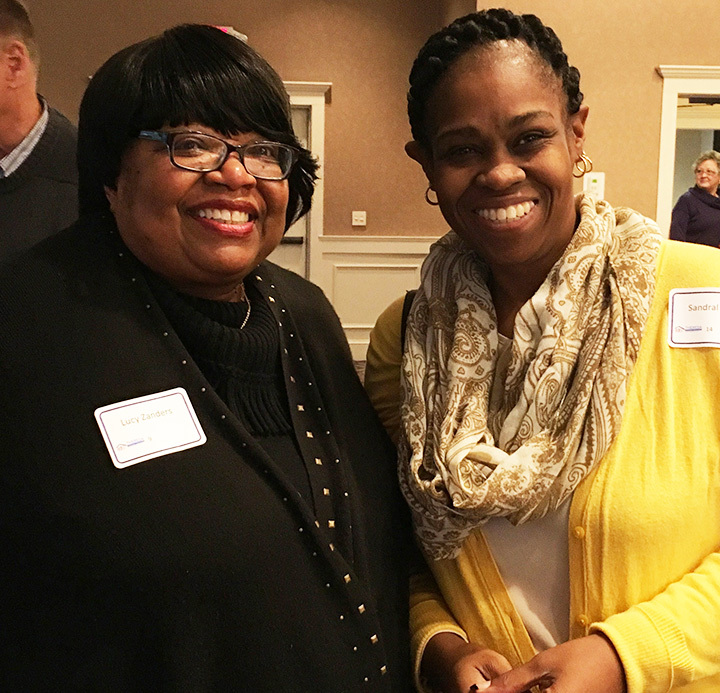 The breakfast was held at the Midland Hills Country Club in Roseville and featured keynote speaker Chris Coleman, Mayor of Saint Paul, and client speakers who talked about how Theresa Living Center helped them find stability and hope after a period of homelessness. Our deepest thanks to all who attended and gave a gift in support of our mission! Registration table volunteers hard at work! More than 150 guests attended to learn more about our mission. 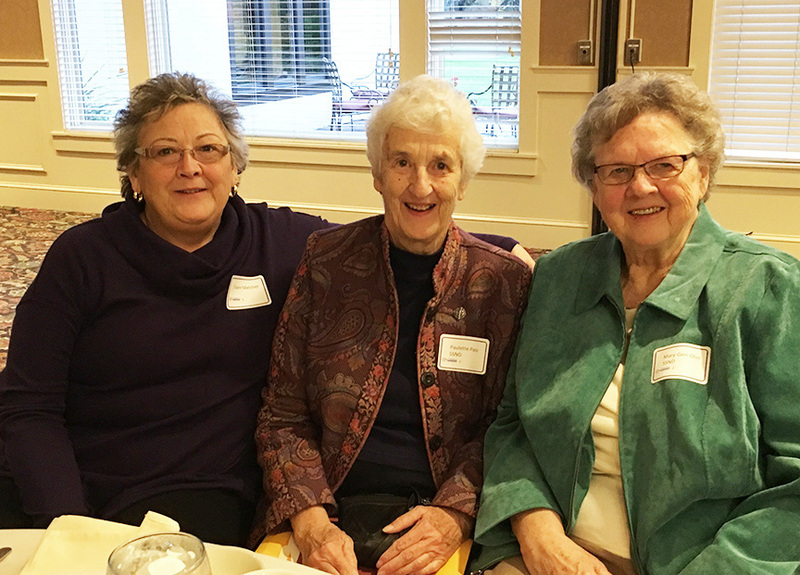 Diane Melcher, Board member Sister Paulette Pass, and one of our founders, Sister Mary Gen Olin. Board member Sheri Ahl, Saint Paul Mayor Chris Coleman, Board member Peg Donahue, Tim Dordell, and Nancy Cameron—all classmates at the U of M School of Law. Beautiful tables - thanks to our planning committee! Paul Verret of the Katherine B. Andersen Fund of The Saint Paul Foundation and TLC Board president Jeff Di Gregorio. Thomas West provided wonderful music for the event. Our Second Annual "Step Up!" Fundraising Breakfast will be held on Wednesday, October 26, 7:30-8:30 AM at the Midland Hills Country Club in Roseville. Registration will start at 7:00 AM. We'll announce further details here soon—but watch your mailbox for our save-the-date postcard! Theresa Living Center celebrated the thirteen new graduates who completed their programs this spring with a ceremony and buffet supper for graduates, their families, supporters, and TLC volunteers and friends. 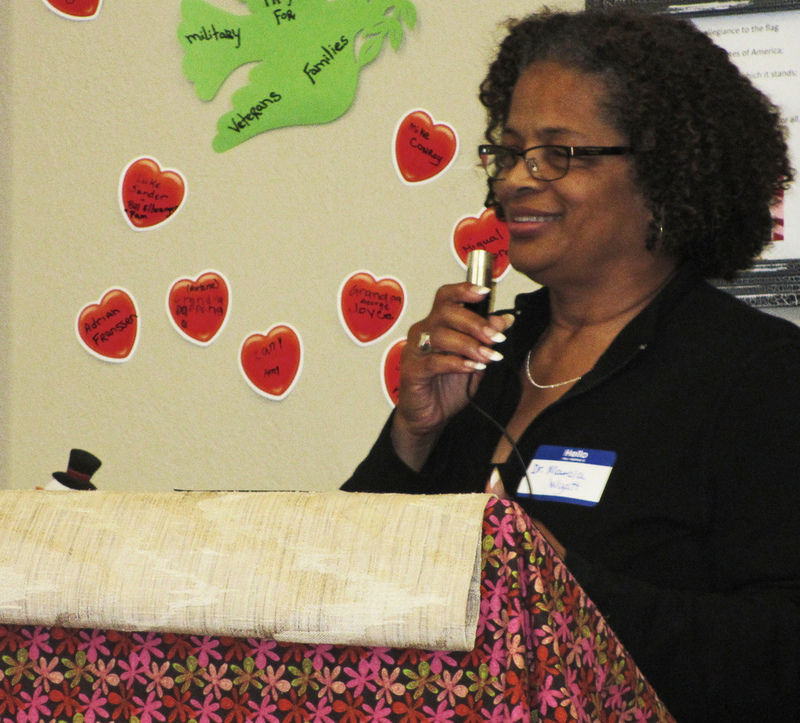 The event, held on May 18, 2015, at the St. Casmir’s School Hall next door, featured guest speaker Dr. Marcia Wyatt, an educator and theologian who specializes in working with children and families challenged by the traditional academic process. Two current program participants also provided their thoughts on shaping the future for success. Graduates have completed a two-year program of rebuilding their self-sufficiency at Theresa Living Center, and now are living independently in their own homes. Congratulations to all of our 2015 graduates, and thanks to all of our volunteers and supporters for helping to make their success possible! Theresa Living Center was the first recipient of Power of 100 Southwest's quarterly charitable giving program.